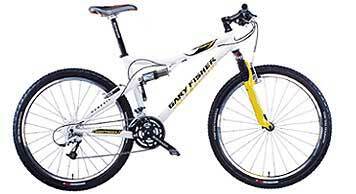 I recently had the pleasure of purchasing a 2000 Gary Fisher Sugar 2 mountain bike. For those of you unfamiliar, this is a state-of-the-art full suspension bike designed with cross country racing in mind. It's designed to provide short rear travel to maintain its climbing prowess, lightness and lateral stiffness that is lost in many more complex multi-linkage designs. The Sugar comes in 3 flavors. The "1" is the top of the line and sports carbon fiber seat stays and some choice component picks over its siblings. The "3" is the entry level model with less expensive components, then there's the "2" (my choice). The Sugar 2 has some components in common with both the other models and retails for about $1700. I had ridden a Sugar 3 demo bike, from Dave's Bike Sport, and was thrilled with its performance, so I was very excited about picking up my sugar 2 with even better parts and about a pound or two less weight. After reviewing the instructions for the rear shock, I pumped up its air pressure, as recommended for my weight (with the included hand pump), and went for my first ride. I was a bit disappointed at first, but soon realized what my problem was. I'd mistakenly set the pressure on the demo. bikes rear shock to 90 lbs. (the recommended pressure being 150lbs.) thus the ride on the demo. had been much more plush. I've since readjusted the air pressure in the rear shock down from to around 120 lbs. and it's feeling much more to my liking. Since I tend to ride off the saddle anyway when going over the big hits, I haven't had any problem with bottoming out the shock. Up front the Sugar 2 sports a Rock Shox SID XC. This is an 80mm travel superlight suspension fork with a combination air/coil spring/oil action. I ended up pumping it up higher than the recommended setting for my weight, to achieve the feel I prefer. The bike comes stock with tires that are appropriate for cross country racing on a hardpack surface. They were a bit slippery for riding in the rain, but I'm sure they'll suit me fine when Annadel dries out for the Summer. If I wished I could switch them for tires with bigger knobs, but for now I'll stick with them. The Wheels are Bontrager's Race wheelset which sports an asymmetrical rear spoke design that allows the spokes to be equally dished on both sides, unlike traditional rear wheels that have a flatter side facing the freewheel. This asymmetrical design is claimed to be much stronger and it makes total sense to me. The Sugar also sports what Gary Fisher calls Genesis Geometry. What it boils down to is a shorter stem and a longer top tube. The idea is to set the riders weight further behind the front wheel so as to lessen the likelihood of going over the handlebars during extreme descents. Apparently Gary made a few of those trips himself (one of them at the late Occidental Ring of Fire race a few years back.) I found that the bike actually felt short (in length) to me, compared to the 1996 Trek 6500 it's replacing). I was able to move the seat back as far as it would go and it feels much better now. I'd highly recommend the Gary Fisher Sugar line to anyone looking for a fairly light, yet durable and capable cross country bike. If the limited travel rear end seems a problem there are lots of other choices on the market, including other Gary Fisher models.